The eastern lowland gorilla—the largest member of the great ape family—is now officially listed as a critically endangered species, according to data presented today by conservationists. These iconic apes have been in steady decline since the 1990s, the indirect result of our insatiable desire for mobile phones and other technological gadgets. 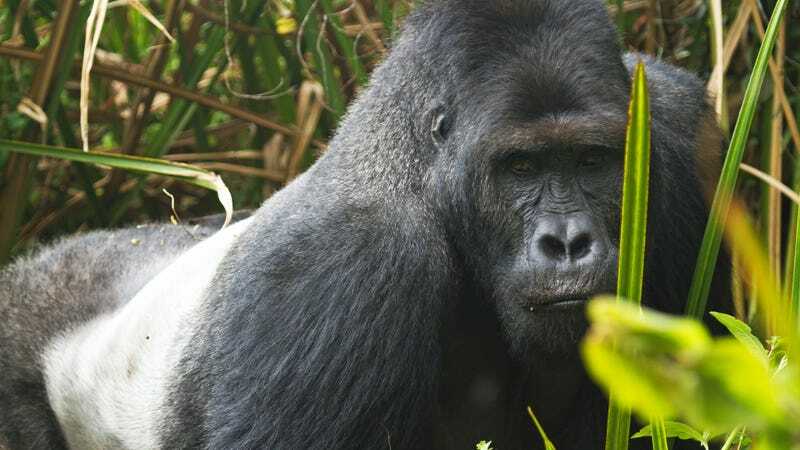 A new analysis published in the open access journal PLOS One is the first rigorous population survey of the eastern lowland gorilla, also known as the Grauer’s gorilla, since civil war broke out in the eastern Democratic Republic of Congo in 1996. Before the war, these apes numbered around 16,900 individuals. The new survey, led by Andrew Plumptre of the Wildlife Conservation Society, suggests this number has dwindled down to just 3,800 individuals. In response, the International Union for Conservation of Nature (IUCN) has added the Grauer’s gorilla to its Red List of critically endangered species. A big part of this dramatic population decline has to do with mining operations that have caused the gorillas’ habitat to shrink. Making matters worse, armed miners have been feasting on bushmeat, including the Grauer’s gorillas. Armed groups are currently fighting in the region to control trade in four highly prized “conflict minerals,” namely gold and the ores that yield tin, tantalum, and tungsten (the so-called 3Ts). Coltan, from which tantalum is extracted, is a mineral essential to virtually every consumer electronics item. An estimated 70 percent of the world’s tantalum is used for mobile phones, televisions, laptops, and similar products. The DRC is currently home to about 80 percent of the world’s coltan. Once refined into metal, tantalum is used to make capacitors (which provide energy to circuit boards) in many electronic products. For the population survey, Plumptre and his team took a look at data collected by local communities and rangers, which included encounter rates at 10 different gorilla nest sites, as well as a habitat analysis of the gorilla’s range. Their analysis suggests that the gorillas’ range is now about 7,606 square miles (19,700 square kilometers), and that the population has declined by a factor of 77 percent in just one generation. “If the eastern lowland gorilla is lost, it will be the first of the great apes to go extinct,” explained bioethicist and conservationist Kerry Bowman to Gizmodo. “It would be a horrible loss as we are just beginning to understand our genetic ‘kin’— the great apes.” Bowman, who works with the Canadian Ape Alliance, is worried about the gorillas’ future, but says practical solutions do exist. Future goals, says Bowman, should include establishing and enforcing extended boundaries for gorilla habitat areas, creating corridors, stopping illegal mining inside protected areas, and legally establishing artisanal mining cooperatives in areas close to gorilla habitats. He says governments and NGOs should try to find alternative sources of income for local people, while consumers should pressure—and even lobby—manufacturers to make sure they acquire their source minerals from mining sites that are free of conflict, and where people don’t hunt for bushmeat. Steve Jobs On Conflict Minerals: "It&apos;s a Very Difficult Problem"